Isaak John "I. J." Dyck: teacher, administrator and community worker; born 8 December 1896 in Nikolaipol, South Russia to Johann and Katharina Dyck, the third son in the family. In 1928 he married Annie Warkentin in Winkler, Manitoba. They had two daughters and one son. "I. J." died 7 December 1975 in Vancouver, British Columbia. In 1924 I. J. moved to Manitoba, Canada where he settled in Winkler, then moved to Winnipeg with his family. In 1944 they left for Abbotsford, BC and finally, in 1966, moved to Vancouver. He committed his life to God in 1921, was baptized three years later by Peter Klassen, at which occasion he also joined the Mennonite Brethren Church. Dyck's education began in his home village of Nikolaipol and continued in high school in the Russian village of New York, near the Sea of Azov, where he graduated in 1914. From there he went to "Realschule" in Berdjansk and then to the technical institute in Kharkov and lastly, to university in the same city. His education was interrupted by the Russian Revolution in 1917. After coming to Canada he learned English, took courses in mathematics, chemistry and physics at the University of Manitoba and then took his teacher's training at the provincial Normal School. A 34-year teaching career began in 1927 in Winkler High School where he spent 13 years. Then, after working as an inspector in a chemical laboratory in Winnipeg for 3 years, the Dyck's moved to Abbotsford where he was hired as a teacher at the newly formed Mennonite Educational Institute (MEI) and was actively involved in the development and expansion of the school. 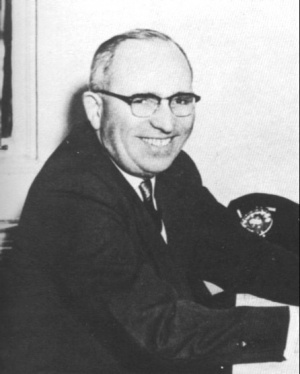 In 1945 I. J. became principal of the school where he challenged the students to work hard and develop a reputation of excellence for the school. He worked to bridge the gap between the rather closed Mennonite culture of the day and the surrounding Canadian culture. In 1957, Dyck resigned from full time teaching and taught part-time until 1966. As a strong educator, I.J. left a great legacy of learning particularly in helping second-generation Mennonite children relate to their immigrant parents. He must also be credited with guiding students in the transition from essentially agrarian pursuits to a great variety of professions. Dyck was a strong supporter of the church and worked to gain the support of local congregations for the school. In the community he was known as a promoter of agriculture and a supporter of the cooperative movement. Political action was natural to him; he became an active member of the local Liberal association and served as its president for some time. I. J. is remembered as a strong person but with "a simplicity of manner, directness of speech, honesty, faithfulness to his Mennonite roots, and trust in God" which endeared him to many in the community. "Isaak John Dyck." Der Bote (10 February 1976): 12. "Isaac J. Dyck." Mennonitische Rundschau (25 February 1976): 1 & 2. "Isaac John Dyck." Mennonite Brethren Herald (20 February 1976): 31. "Isaac John Dyck." MEI Jubilee Edition, Volume 50,1944-1994: 15. Friesen, Hugo. "Dyck, Isaak J. (1896-1975)." Global Anabaptist Mennonite Encyclopedia Online. April 2002. Web. 21 Apr 2019. http://gameo.org/index.php?title=Dyck,_Isaak_J._(1896-1975)&oldid=143044. Friesen, Hugo. (April 2002). Dyck, Isaak J. (1896-1975). Global Anabaptist Mennonite Encyclopedia Online. Retrieved 21 April 2019, from http://gameo.org/index.php?title=Dyck,_Isaak_J._(1896-1975)&oldid=143044.